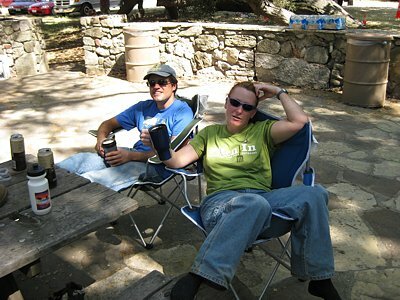 Relaxing with a couple of cold ones before the barbeque dinner and camp-out after a previous Santa Monica Mountains Trails Days in Pt Mugu State Park (Sycamore Canyon). See story. Los Robles Trail Update. We recently published a blog entry about a section of the Los Robles Trail in Thousand Oaks that is on private property. It seems that certain individuals have been doing more than crossing over the private dirt access road to connect to the trail (unauthorized activities include straying from the path of travel and stopping traffic so that people in the group of trail users can cross unimpeded). As stated in the earlier story, trail users should only cross the road on their way to the other side to access the trail. Anything else is illegal and could jeopardize future access. But don't take my word for it, check out the signs that were recently installed (see photo). This brings up an interesting point. Locals know the value of the Los Robles Trail, but perhaps those who use the trail who don't live in the area have less respect for signage and protocol. So first, I ask that everyone—locals and non-locals alike—respect the signage on the Los Robles Trail. Secondly, I challenge each and every CORBA member to take this concept to heart wherever you ride—pay attention to signage, and act as if your every action could impact access to the trails. Remember, your actions speak for the entire user group you represent, whether you’re an equestrian, hiker, or mountain biker. 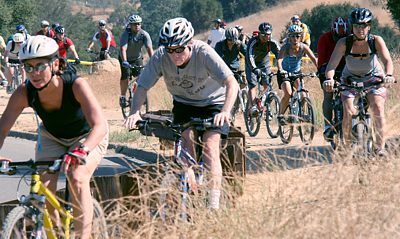 This is a weekend event with CORBA, SMMTC and other trail user groups with camping at Danielson Ranch in Point Mugu State Park. You can come in Friday night and stay until Sunday or leave Saturday after trail maintenance. Some people just come in for Saturday. There will be a barbecue and raffle on Saturday evening. 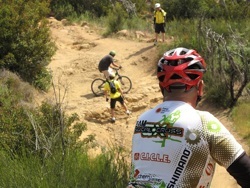 The CORBA crew will be riding in to work on the Guadalasca and Wood Canyon Vista section of the Backbone Trail. Driving to the trailhead and hiking in is an option too. We will work on adding drainage to the trail as well as brush work! There is a lot to do after this winter’s heavy rains so come on out and lend a hand! In September 2009 CORBA representatives attended a series of public hearings on the San Gabriel Watershed and Mountains Special Resources Study. During those public meetings the NPS outlined possible ways of improving the management of the San Gabriel watershed, as mandated by Congress. The National Park Service has released their Draft Alternative Concepts Public Outreach Results, including comments sent by CORBA and our members and supporters. read the full story in our blog entry. Saturday May 1st is the next skills clinic.